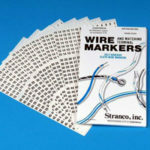 Stranco’s wire marker cards provide a convenient way to inventory, carry, and use wire markers. Choose from a superior selection of stock wire marker card legends or contact us about having custom wire marker cards prepared for your special needs. 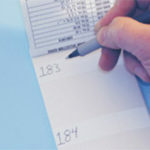 Wire marker cards are available in vinyl coated cloth, laminated polyester, and acetate cloth tape. 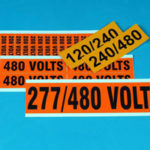 The ST2 Series of wire marker cards is constructed of vinyl coated cloth with a high-tack rubber adhesive, providing durable marking that is resistant to dirt, oil, grease, and water. ST2 wire marker cards are sold in packages of 25 cards. Not all standard legends are identified in the tables below. Call for information on additional wire marker card legends. 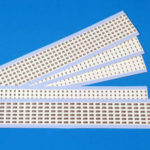 Similar to the ST2 Series, but constructed of laminated polyester, the TM2 Series of wire marker cards is designed for demanding environments. These markers are printed on a thin white polyester film with a permanent acrylic adhesive, and then laminated with clear polyester to protect the marker legend. Durable and yet low profile, these markers are highly resistant to abrasion, dirt, oil, grease, water, and most chemicals and solvents. 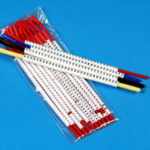 TM2 wire marker cards are sold in packages of 25 cards. Not all standard legends are identified in the tables below. Call for information on additional wire marker card legends. PER CARD ST2 SERIES STOCK NO. TM2 SERIES STOCK NO. LEGEND MARKERS PER CARD ST2 SERIES STOCK NO. TM2 SERIES STOCK NO.